A guaranteed disaster? Art auction houses left hanging as the market turns. Picture this (if you’ll pardon the pun) – you are the fortunate owner of an artwork of mind-blowing significance. The art market is booming – nay, it’s gone warp speed, hyperbole be damned. You love your painting… have loved it and treasured it for many years. But the sky-rocketing prices prove too much for you. You approach an auction house or three – this is a seller’s market, remember. No point settling for the first offer you get. A pre-auction bidding war ensues. One of the auction houses offers you a guaranteed minimum price – if that price isn’t reached during the auction, the auction house will be compelled to pay you the guaranteed price and to take the painting into its possession. Nothing to lose, right? Well, it must have seemed like a good idea at the time. But now that art buyers are more concerned about paying the heating bills and filling the fridge than buying art (as much as art warms the cockles of the heart and nourishes the soul), the practice of offering art-sellers a minimum price when they consign works for sale may well have left the big auction houses in a bit of a pickle. In Sotheby’s case, a pickle of the magnitude of up to $US 500 million. That’s a very, very big pickle. In documents filed with US authorities in April 2007, Sotheby’s listed outstanding guarantees of $US 295 million. Although I’ve been unable to find an indication of the company’s exposure in late 2008 when things started to go pear-shaped, the board set a ceiling of $US 500 million on its exposure through guarantees. Comparable figures for Christie’s, which is not a public company, are not readily available. But to give a sense of how much of the art that passed through the top end of the market may have been guaranteed, witness the following figures: Sotheby’s guaranteed 78% of a single contemporary sale by value (14 November 2007), and Christie’s 52% of its 13 November 2007 sale. So, the last sales of 2008 and the first of 2009 are likely to have been pretty tricky for the big auction houses. Artworks consigned for sale under the old guard popped up on the rostrum, with associated guarantees and big promises, but with far fewer big-spenders in the audience. 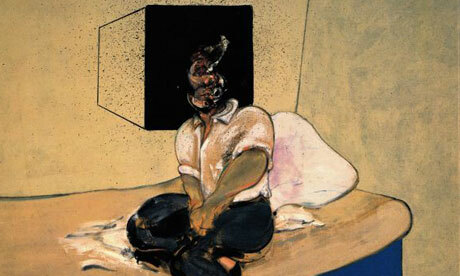 Case in point: Francis Bacon’s Study for Self-Portrait [pictured] turned up at Christie’s in November 2008 with a minimum estimate of $US 40 million. The Florida-based collector, George Weiss, consigned the painting for sale at Christie’s after the auction house offered him a guaranteed minimum price. But the ultimate timing of the auction wasn’t so flash-hot. Weiss’ painting, which was billed as the sale highlight, was sharing wall-space with works consigned by Lehman Brothers ne’er do well, Richard Fuld. Not a good time to be competing for attention with such a tangible reminder of the unfolding economic disaster. The Bacon did not sell. In fact, almost a third of the 75 contemporary works on offer that night didn’t find buyers. Weiss expected to be paid his guaranteed minimum price. Christie’s International, citing “the changed climate of the art market”, refused to pay up, according to the breach-of-contract complaint Weiss filed in New York. Could this just be the tip of the proverbial iceberg?